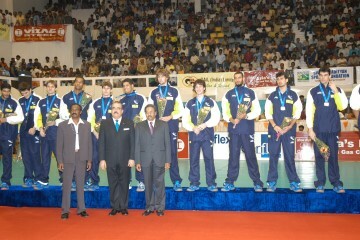 Visakhapatnam, India, August 14, 2005 - Russia brushed aside Brazil 3-0 in the final of the FIVB Men's U21 World Championship on Sunday. In another powerful all-round team performance, the "Big Red Machine" romped home 30-28, 25-18, 25-23 in 73 minutes. Brazil, wearing an unfamiliar dark green uniform as opposed to their customary canary yellow, never really got going against the European aristocrats, and finished well beaten.